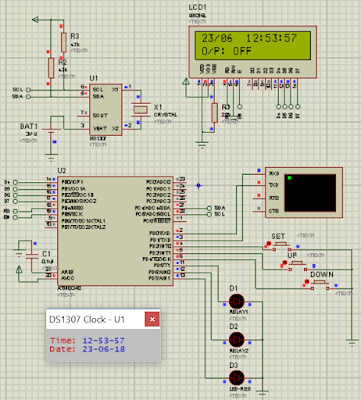 here is one more data-logger circuit, which will be useful for some who have not much ventured into the ADC for datalogging or RTC or i2c communication, etc. This one is based on ATmega32. It has 8-channel 10-bit ADC. Hence, providing us with 8-channels with 0 to 5V voltage level measurement. The circuit also has on-board RTC (based on DS1307) to log the data with time-stamp. Data is logged via UART. The circuit has 3-pin UART connector, which can be used to connect to PC/laptop using UART(TTL) to USB serial converter, commonly available in electronic markets. Also, there is a thermometer IC, DS1621, which is connected via i2c (along with the RTC IC) and provides temperature measurement from -55 to +125 Deg. C. The temperature is also sent along with the voltages to the UART for logging. (Note: The circuit also has the microSD card module connector, for logging the data into the card in FAT32 file format, instead of sending it to UART, but that part is not used here, as this initial part is more intended for new learners. Part-2 with microSD will be included shortly in the next update. Meanwhile, you may refer to my earlier post on microSD related posts, here and here, for getting some details and code for SD card/ FAT32 format). At power on, the current date and time are displayed on the first raw of LCD. The temperature and the logging ON/OF status is displayed on the second raw. A green LED is also turned ON as an additional status of the proper power-up of the microcontroller . The data measurement can be started anytime by pressing the 'SET' button (keep pressed till the red LED turns ON). The recording ON status is displayed on LCD as well as by the glowing red LED. During this recording, at a regular interval (as defined in the code), the microcontroller gets the temperature from DS1621, measures the 8 voltages connected to 8 of its screw-terminals, w.r.t GND on the 9th terminal (as shown in the schematic), and forms a string which includes line number, time (hh:mm:ss format), temperature and the 8 voltage values, in a comma separated format. This string is then sent to UART, which can be logged into a file or seen on a terminal program in the PC/laptop using the serial-to-usb converter. (Note: The Proteus simulation files are included in the source code folder download at the end of the post). The actual UART output captured on a terminal of the Atmel Studio during the logging ON, is shown in the left side image, where temperature shown is 30.3 C, channel-2 was connected with +5V (VCC) and channel-7 was connected with the Li battery cell of the RTC. Rest of the channels were kept open at the screw-terminals. When the Minutes is set, "RTC Setting" mode is over and normal operation resumes, where the LCD will display Date and time in the first row and temperature and log:OFF status in the second row. The circuit hardware is not much complicated, can be assembled on a general purpose PCB also. I'm including here the Gerber files also, along with the other downloads, if it's required. aim of this project is to present a way to store a large quantity of data into microSD card in files with FAT32 format. 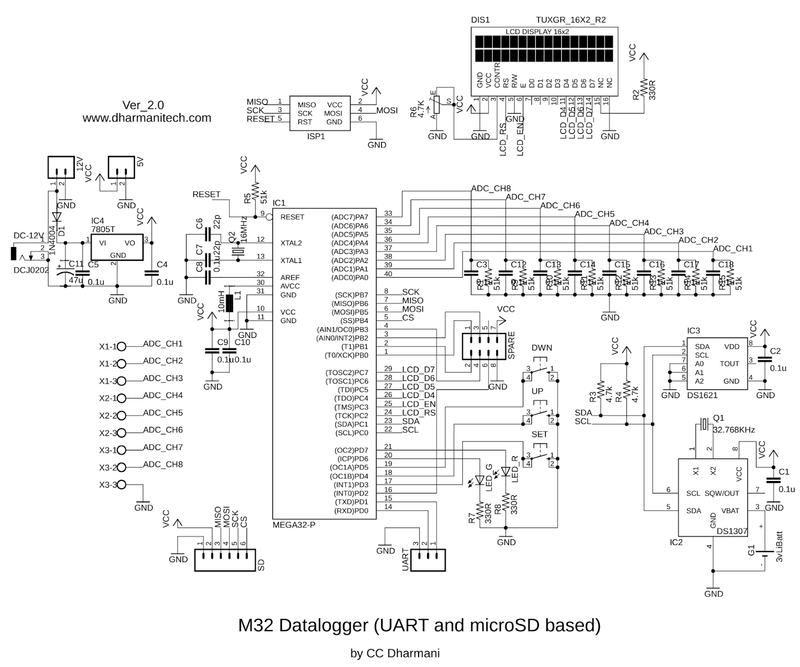 Here, ATmega32 is used for data collection and microSD interface. 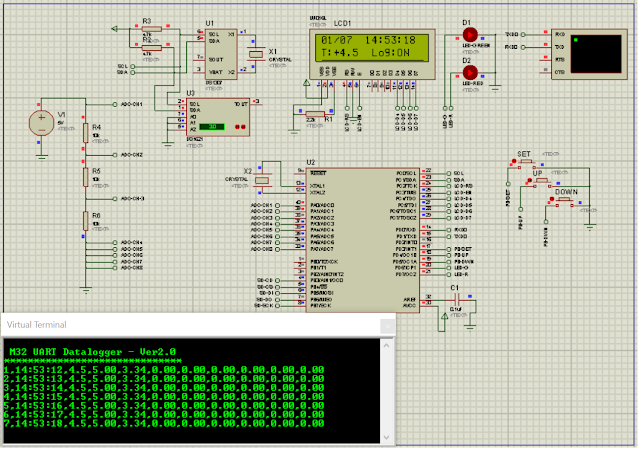 The data is received from in-build 8-channel ADC of ATmega32. One channel is used for reading temperature from LM35 sensor and remaining channels are used for simply reading voltages and storing them. 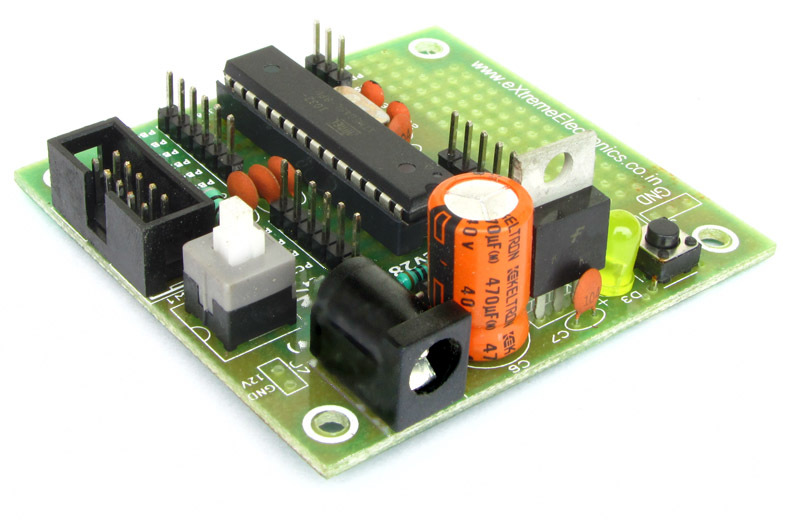 This project can be used to interface 8 different sensors with ADC of ATmega32, similar to the LM35 used here. The data is stored in CSV (comma separated values) format, which can be read using a PC/Laptop with Microsoft Excel or other compatible software. A snapshot of the excel file is given later in this post. This project is an example of how to use the microSD FAT32 library presented in my earlier post. In that post, the files were created using hyper-terminal and entering data with the PC keyboard, since that demonstrates the file creation and it's easy to debug. But many users have requested to make the file creation independent of the terminal, done inside the microcontroller, so I'm showing here how to use those functions independent of terminal. If you have directly landed on this page, it would be more helpful if you visit the original post first as it would be a better starting place for learning SD or FAT32 functions. The project contains RTC interface (for date and time storage), RS232 (for connection with PC) and a microSD module. Here, the hyper-terminal connection is required only for setting RTC date and time. Once the date/time are set, the RS232 connection is not required anymore for normal data-logging operation (It can be used for debugging purpose if there is a problem). The microSD module used here is from eXtreme Electronics. The module is shown in the figure here. 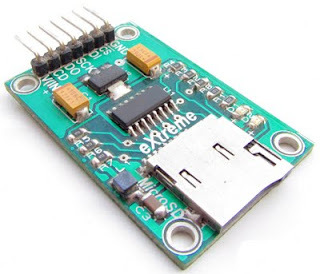 Other than the microSD socket, this low-cost module also contains on-board 3.3v regulator for the microSD card, a 5v-3.3v level converter and other safety features required for the card. 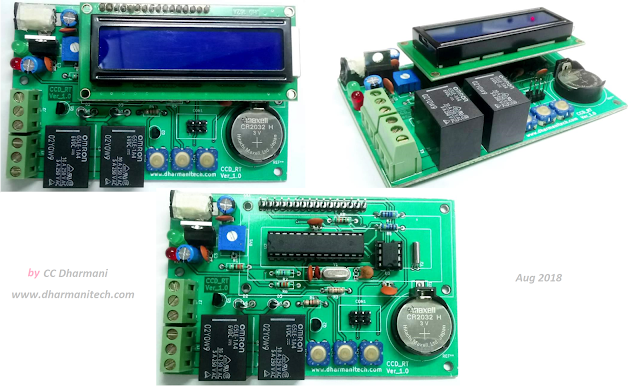 This module is used here as it provides a stable interface and makes the the card compatible with 5v supply and 5v signals of microcontroller. 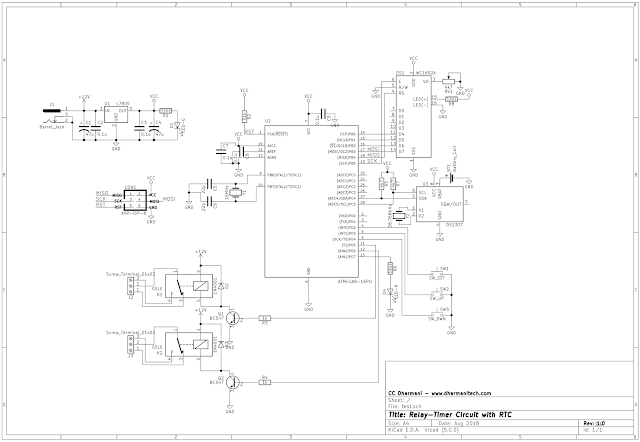 The schematic also shows two LEDs and a push-button. The LEDs are used for indications of power and recording and the push-button is used to start-stop recording. The operation is very simple as it uses just one push-button and an LED indication. In case of any error in accessing the card, red LED will blink continuously. In such a case, you can start circuit in debug mode (with terminal) and see the error messages. Files are stored with the date as a name and .CSV extension. 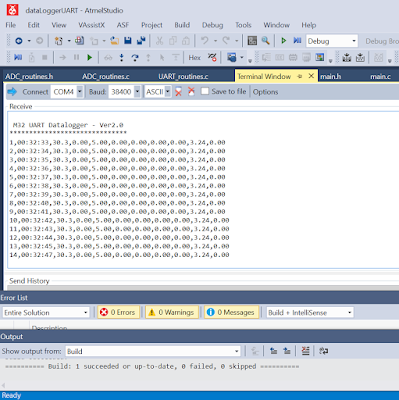 For example, data-logging done on 10 May 2011 would be stored in "10052011.CSV" file. Since the date is the name of file, everyday a single file is created and all the data recording done in a day goes into single file, no matter how many times the recording is stopped/started. First column of the file shows date, second shows time and next 8 columns show data from the 8 channels. A file created during testing is shown in the figure below, where 5 sec interval was set for measurements (click on the image to enlarge it). Here channel-0 was used for LM35 temperature sensor, and remaining channels measure voltage. 5v was connected to channel-1 and 3v Li cell was connected to channel-3 (Channel 2 & 4 show some small voltages due to noise from voltages connected to nearby channels, which can be corrected by using bypass caps). The interval between two measurement cycles is defined in main.c file, which can be set as per the user requirement. 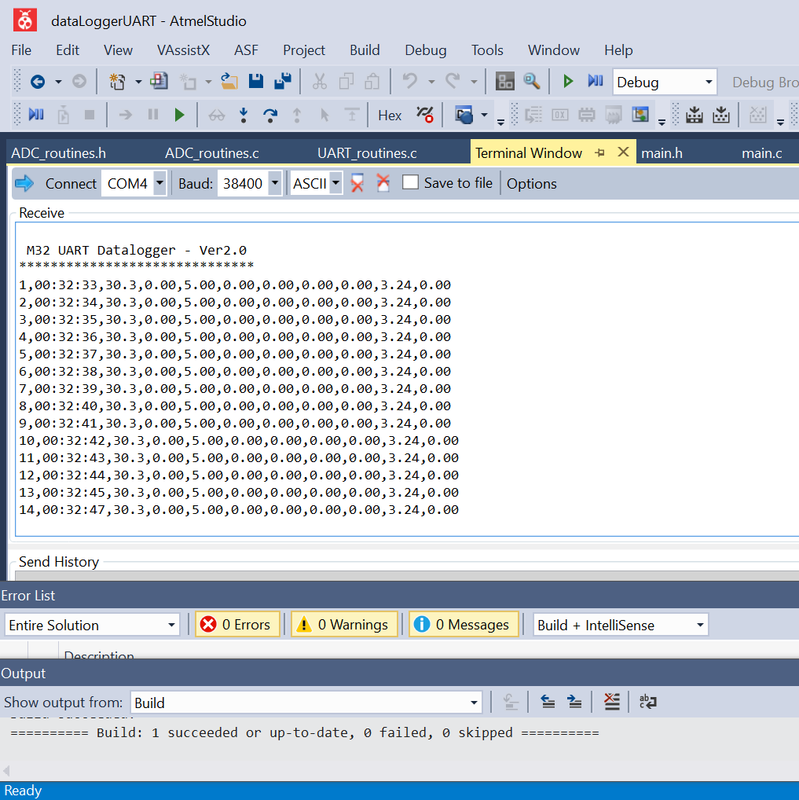 Basically, the program forms a dataString in every measurement cycle and appends this string to the file, if the file already exists or it creates a new file (for example, during the first recording in a day). You may go through the comments in the source code file for more info.